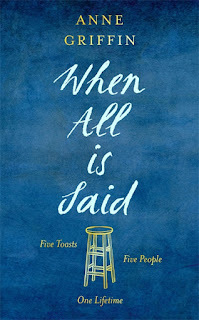 When All is Said by Anne Griffin is my first book of 2019 and what a great book to kick of the year. In this book we meet dear Maurice Hannigan who is an 84 year old gentleman who is set to spend the evening at the bar in the local hotel, but this isn’t an ordinary evening, it is the 2 year anniversary of his wife’s passing and Maurice is desperately missing her. 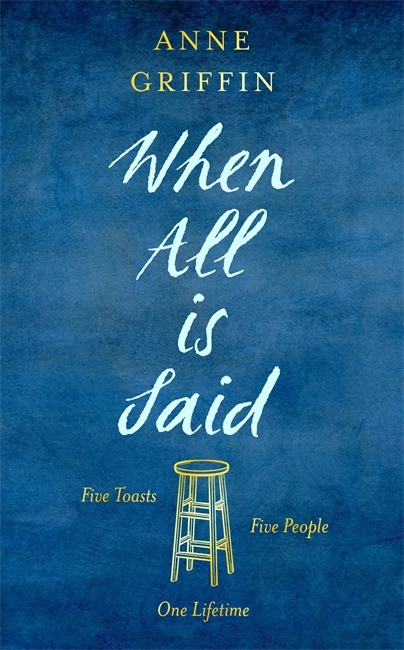 Maurice is set to make 5 toasts to significant people in his life and through his toasts we journey with him through his life from a young lad right up until the present day. The story is told by Maurice himself and yet the author shapes the loved ones he talks about so well they soon become a vivid part of the story and it is clear to see what loving and caring people he has blessed with to have around him throughout his life. It did take me a couple of chapters to get into the swing of this book because the way in which the story is told is through Maurice’s thoughts and yet he seems to direct the conversation towards his son Kevin, but after a couple of chapters I was soon won over by his Irish charm even though it didn’t take long to see that Maurice could be a grumpy, difficult and stubborn fool at times. I particularly enjoyed the relationship between Maurice and his brother Tony and I found this part very touching. This isn’t a book that is full of dramatic twists and turns, we are pre-pared for what lies ahead and yet I still found myself captivated by Maurice’s life story. It is the simplicity of the storyline along with a much loved main character with his Irish charm and his honest storytelling that made this such a beautiful and tender read. This book looks at Maurice’s regrets and achievements as well as his relationships with those around him. I thoroughly enjoyed this book and look forward to reading future releases by Anne Griffin as she is a wonderful storyteller whose Irish charm is felt through the pages. This is a praiseworthy debut and definitely an author to watch out for.